and to keep your nutritional goals on point! Fueling your body with proper nutrition is a necessity. However, choosing the proper meals can feel overwhelming. Deciding, planning ahead, balancing nutrition, shopping and prepping are all challenges to staying on plan. Having a meal that is quick and easy to make, and have on hand, is imperative to supporting your workouts and to reaching your body goals. This Taco Rice Bowl fits the bill perfectly. It only takes about a half hour, and one pan, to make. The ingredients are few and simple, creating a flavorful dish that is also a comfort food. Enjoy it warm or cold. This dish travels well in a lunchbox. Brown rice is a good source of complex carbohydrates, whichprovides energy for your body to work. Lean beef is great for feeding muscle growth and repair. I imagine that you could use any protein source successfully in this dish; lean ground beef, ground chicken, ground turkey ,tofu, etc. This dish is one of my go to meal preps. It is easy to make several ahead, layering ingredients in a mason jar or Tupperware. You can customize it by adding chopped peppers, or even jalapeños. My habit is to eat some of this before my workout; finishing the meal after my workout. This allows the dish to work as fuel and recovery. It is also a family frendly meal. This dish is one of my go to meal preps. It is easy to make several ahead, layering ingredients in a mason jar or Tupperware. You can customize it by adding chopped peppers, or even jalapeños. My habit is to eat some of this before my workout; finishing the meal after my workout. This allows the dish to work as fuel and recovery. It is also a family friendly meal. Give this a try and let us know below what you think. Do you have some variation ideas to share? Do so in the comments! Check out our other Fit Food Friday recipes; as well as food prep information! 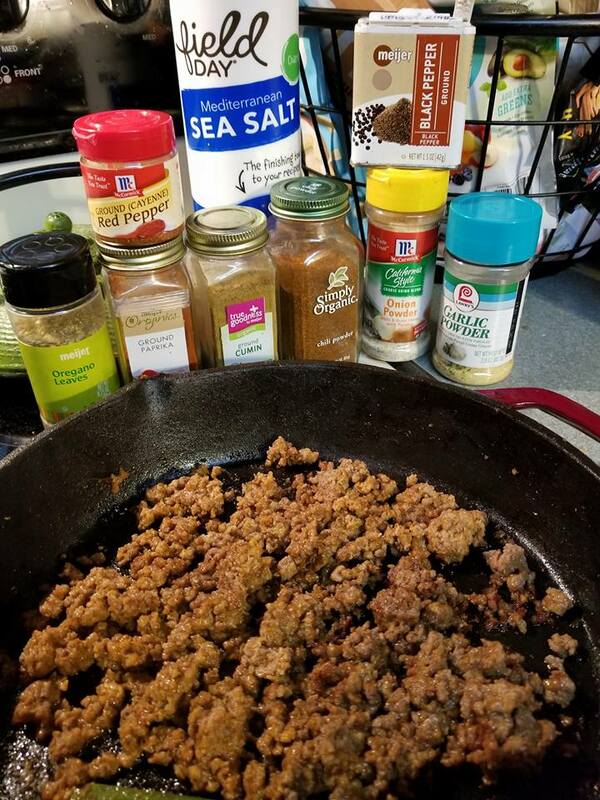 mix together thoroughly in a clean and dry mason jar: 2 TB chili powder, 1 t garlic powder, 1/2 tsp onion powder, 1/4 tsp crushed red pepper flakes, 1/2 tsp dried oregano, 1 tsp paprika, 3 tsp ground cumin, 1 tsp sea salt, 2 tsp ground black pepper, 1 TB almond flour [helps seasoning cling to meat]; store in a cool dry place, sealed in a mason jar. 3. add 3 Tablespoons taco seasoning mix and 1/8 cup of water. cook over medium low heat until water is absorbed and meat is coated with seasoning. 4. Prep your meals. This recipe makes 3 or 4 servings, depending on your needs. 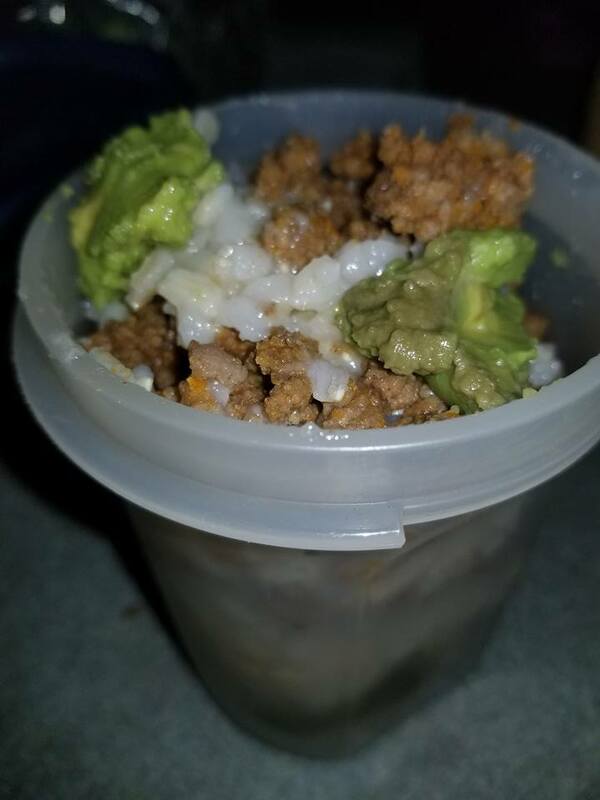 I layer brown rice, cooked meat, and a drizzle of dressing (only 1 Tablespoon for entire bowl), then top with avocado. 5. This recipe can be eaten right out of the lunch box or reheated, depending on your circumstances. **You can keep this recipe in the fridge for up 5 days. You can make these up ahead of time and keep refrigerated. Remember that this recipe eats well hot or cold!